In this issue of GS:MotorradMagazin : SPEZIAL: Die neue R 1200 GS Rallye und R 1200 GS Exclusive im (Er)Fahrbericht. 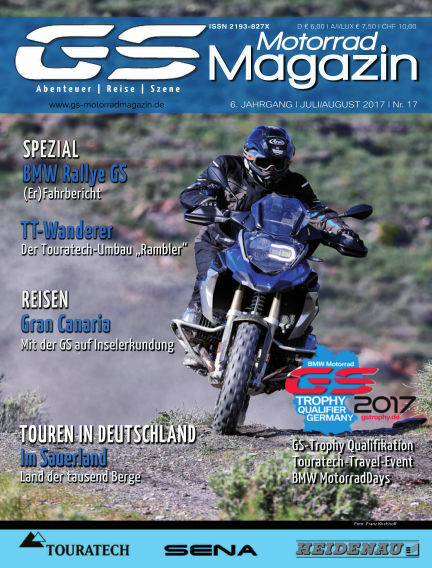 - Alle großen GS Events: Touratech Travel Event, GS Trophy Qualifyer 2017, BMW MotorradDays - Reisestories: Sauerland (Über tausend Berge) - Gran Canaria (auf Inselexpedition) uvm. With Readly you can read GS:MotorradMagazin (issue Nr. 02 2017 (#17)) and thousands of other magazines on your tablet and smartphone. Get access to all with just one subscription. New releases and back issues – all included.